Home > Used Vehicles > 2011 Hyundai Elantra Touring GL,HATCHBACK,AIR,TILT,CRUISE,PW,PL,TILT,CRUISE,LOCAL TRADE,GREAT VALUE!!! LOCAL TRADE, VERY CLEAN!! 2011 Hyundai Elantra Touring GL,HATCHBACK,AIR,TILT,CRUISE,PW,PL,TILT,CRUISE,LOCAL TRADE,GREAT VALUE!!! LOCAL TRADE, VERY CLEAN!! Cylinders: 2.0L I4 16V MPFI DOHC - 4 cyl. Hot Deal! We've marked this unit down $2958 from its regular price of $9900. 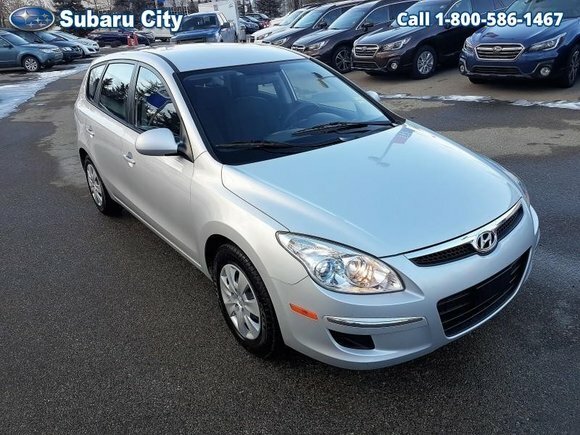 This 2011 Hyundai Elantra Touring is for sale today in Edmonton. The 2011 Hyundai Elantra Touring proudly displays its European roots as a spacious and solidly constructed compact car with surprisingly sophisticated road manners. Designed in Europe, the Touring looks more athletic, with smoother flowing shapes than the sedan. Under the sheet metal, you'll find more responsive steering and handling that provides a sportier driving experience.This hatchback has 75250 kms. It's continental silver metallic in colour. It has an automatic transmission and is powered by a 2.0L I4 16V MPFI DOHC engine. This vehicle has been upgraded with the following features: Air, Tilt, Cruise, Power Windows, Power Locks, Local Trade, Very Clean. Want to try the 2011 Hyundai Elantra Touring GL?